Use the following information to answer the next two questions. DNase hypersensitive sites around a gene were mapped by treating nuclei from cells that express that gene with increasing amounts of DNaseI. The partially digested DNA was isolated, cut to completion with a restriction enzyme, and analyzed by Southern blot-hybridization using a radioactive probe that is located 3' to the gene. 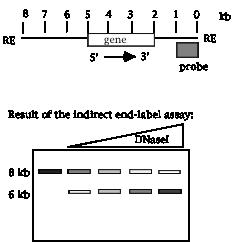 Cleavage of genomic DNA with the restriction enzyme generates an 8 kb fragment that contains the gene, and the probe for the blot hybridization is located at the right end of the fragment (left to right defined as the direction of transcription of the gene). The results of this indirect end-labeling assay shows a gradual fade-out of the 8 kb fragment with increasing [DNaseI], and the appearance of a new band at 6 kb with DNaseI treatment. 20.1 Where is the DNase I hypersensitive site? 20.2 If the start site for transcription is 5 kb from the right end of the restriction fragment, what is a likely possibility for the function of the region mapped by the DNase hypersensitive site? Gcn5p is needed for activation of some, but not all, genes in yeast. Gcn5p does not bind with high affinity to any particular site on DNA. Gcn5p will interact with acidic transcriptional activators. When incubated with histones and the following substrates, Gcn5p will have the designated effects. A + in the column under "Effect" means that the histones move slower than unmodified histones on a polyacrylamide gel that separates on the basis of charge, with the histones moving toward the negatively charged electrode. A - means that the treatment has no effect on the histones. S-adenosylmethionine is a substrate for some methyl transfer reactions, and NADH is the substrate for ADPribosyl-transferases. 20.3 What conclusion is consistent with these observations? 20.4 What enzymatic activity is associated with Gcn5p? 20.5 Which step in the gene expression pathway is likely to be regulated by Gcn5p? 20.6 What functions have been ascribed to the locus control region of mammalian beta-globin genes? 20.7 Use the following information to answer the next 6 parts (a-f) of this question. The regulatory scheme is imaginary but illustrative of some of the models we have discussed. The protein surfactin is produced in the lung to provide surface area for efficient gas exchange in the alveoli. Let's suppose that expression of the surfactin gene is induced in lung cells by a new polypeptide hormone called pulmonin. Induction by pulmonin requires a particular DNA sequence upstream of the surfactin gene; this is called PRE for pulmonin response element. Proteins that bind specifically to that site were isolated, and the most highly purified fraction that bound to the PRE contained two polypeptides. A cDNA clone was isolated that encoded one of the polypeptides called NFL2. Antisera that specifically recognizes NFL2 is available. The mechanism of the induction by pulmonin was investigated by testing various cell fractions (nuclear or cytoplasmic) from uninduced or pulmonin‑induced lung cells in two assays. The presence or absence of NFL2 polypeptide was determined by reacting with the anti‑NFL2 antisera, and the ability to bind to the PRE DNA sequence was tested by an electrophoretic mobility shift assay. In a further series of experiments, the NFL2 polypeptide was synthesized in vitroby transcribing the cDNA clone and translating that artificial mRNA. The product has the same amino acid sequence as the native polypeptide and is referred to below as "expressed cDNA." The expressed cDNA (which is the polypeptide synthesized in vitro) was tested in the same assays, before and after treatment with the cytoplasmic and nuclear extracts and also with a protein kinase that will phosphorylate the expressed cDNA on a specific serine. Based on these data, an affinity column was made with the expressed NFL2 cDNA as the ligand and used to test binding of proteins from nuclear extracts. When the column was pretreated with protein kinase + ATP (so that NFL2 was phosphorylated), a ubiquitous nuclear protein called UBF3 was bound from nuclear extracts from both induced and uninduced cells. If the NFL2 ligand was not phosphorylated, no binding of nuclear proteins was observed. To confirm that NFL2 really was part of the protein complex on PRE, antibodies against NFL2 were shown to react with this protein‑DNA complex. Furthermore, antibodies against phosphoserine, but not antibodies against phosphotyrosine, reacted with the specific PRE‑protein complex. Answer questions a to f based on the above observations. c) From the data in lines 6‑13, what must happen to the in vitrosynthesized NFL2 (the expressed cDNA) in order to bind to the PRE site? d) What proteins and covalent modifications of them are required to bind to the PRE site? e) Which cell compartment has the protein kinase that acts on NFL2? f) What model for pulmonin induction of the surfactin gene best fits the data given?